We mentioned BeeKeyboard in passing when the developer added iCADE game support as a plugin to the versatile utility. The plugin allows for any connected keyboard to fill in for a iControlPad or iCADE game pad, but we found this only scratches the surface of BeeKeyboard’s usefulness. 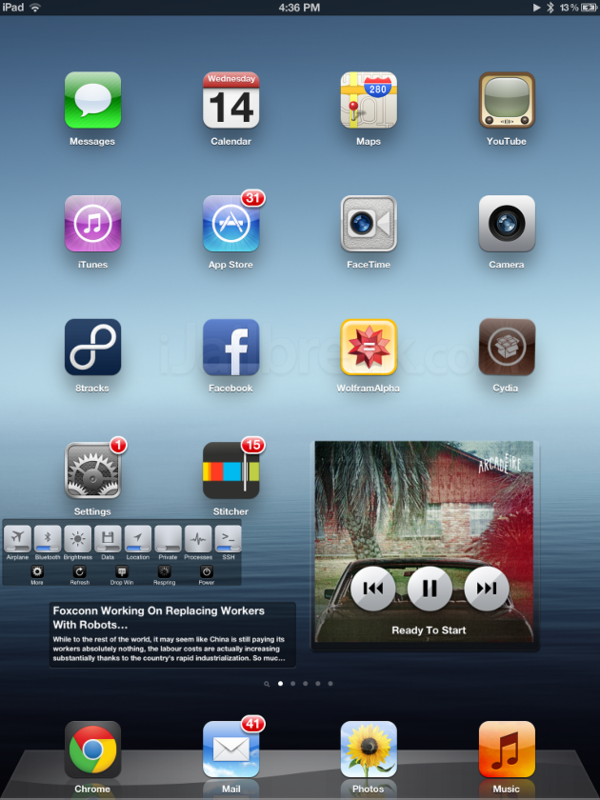 BeeKeyboard highlighting the Cydia app icon on the Springboard. By default, iOS’ keyboard support is shockingly limited. You can use a keyboard to type, adjust brightness, and fiddle with a basic set of media controls–that’s it. You can’t navigate with the keyboard, and–unless you’re editing text–you can’t use it to interact with apps. If you’re using a keyboard case, you’ll find (for the most part) your keyboard will be hanging off your iPad as a useless hunk of plastic. BeeKeyboard includes plugins for homescreen navigation, basic in-app controls, global shortcuts, and system wide editing. You can also download additional plugins that expand BeeKeyboard’s functionality, like BeeSafari, KeyboardMouse, and iCADEHelper for BeeKeyboard. The expandability makes BeeKeyboard one of the most versatile Cydia utilities we’ve seen. The Homescreen navigation plugin allows BeeKeyboard to launch apps from the springboard. The most polished of BeeKeyboard’s plugins is Homescreen navigation, which is what separates BeeKeyboard from similar tweaks like BTStack Keyboard. Homescreen navigation means you won’t be reaching to the touch screen to open apps. Pressing the arrow key shades in an icon on the springboard–this feels just like navigating with a keyboard on a desktop PC. Pressing Enter launches whatever you’ve highlighted, while the numbers 1-9 take you to different pages of apps. 0 brings you right to the Spotlight search. It’s very well executed. The Basic – App plugin allows for similar control within app menus, but isn’t quite as untuitive. It’s a little clumsier, but you can use the keys (control+tab by default) to select interface objects. By shading the right interface elements you can even use the arrow keys to scroll through apps like Facebook. Control+Space acts as a touch for the shaded on-screen buttons. It’s not the best way to navigate through every app, but it will give you more use for your keyboard. The Basic – Global plugin enables key features that really should have been enabled on the Apple Wireless Keyboard to begin with, but weren’t. The plugin assigns additional buttons for the Switcher, the Notification pane, the home button, and assigns commands to the brightness controls if your keyboard doesn’t come with them. It also enables flipping between apps using key combinations. There are also optional toggles for services like WiFi, Bluetooth, screen rotation, and Airplane Mode. The System Shortcuts allow you to toggle keyboard editing shortcuts, like control+F and control+B for moving the cursor forwards and backwards respectively. You can also disable shortcuts such as shift+arrow, if you want to use them for other functions besides highlighting text while editing. Overall the plugins bundled with BeeKeyboard are very solid. The additional plugins available in Cydia so far can be useful, but aren’t always as reliable. On the bright side, all the additional plugins we’ve seen so far are free. We found the most stable of the additional plugins is BeeSafari, which enables shortcuts that come standard with most modern browsers. There’s backspace to go back a page, F5 to refresh, command+T for new tabs, command+F to search, and arrow keys for scrolling. It’s very comprehensive and–like most of the BeeKeyboard plugins–you can set the key bindings to your preference. The only thing we don’t like about BeeSafari is that it’s not compatible with Chrome. Though glitchy,when iCADEHelper is working properly, it’s my favorite plugin. If you really want to go crazy, pair iCADEhelper with Blutrol. Together they should enable keyboard support for most games that use virtual buttons. I wasn’t able to get KeyboardMouse working at all, unfortunately. Activating the plugin just causes the springboard to crash on my iPad. This is disappointing as it would have allowed for a better in-app method of navigation than Basic – App. You might have better luck with it. BeeKeyboard is available in Cydia through the BigBoss repository. The tweak costs $2.99, and given all the functionality it unlocks, I’d say it’s worth the money. If you have a keyboard case or if you want to enable a more ‘desktop-like’ experience on the iPad, BeeKeyboard is indispensable. If you only have an iPhone or an iPod Touch, it might not be worth it on the small screen. Should Apple allow the keyboard to do more by default? Share your thoughts in the comments section below. how do you hit the “back” button when your in-App mode, like in Settings and you drill down, but how do you get back up and out??? ?